Money makes money! Is there anyone who disagrees? The same way customers make customers. Okay, so here’s the deal — your customers are one of the most influential marketing forces you have, but only if you use their influential powers effectively. This is where word of mouth marketing comes into play. Word-of-mouth(WOM) marketing is one of the most powerful assets – much more than any other form of marketing, whether it is paid or organic. So, how difficult it is to ask your customers to advocate your credibility on your behalf? Not much! That said, it does require a solid array of techniques. In this article, we will show you some of the most effective words of mouth marketing techniques to grow your B2B business. As the name suggests, user-generated content is the content about your brand that is created and shared by your existing customers. As we saw in the above infographic how people are influenced by other people, user-generated content will help your brand build trust and authority in the market. In fact, 85 percent of consumers find visual user-generated content more influential than brand photos or videos. Now that you are sure of its impact, how will you leverage this technique of word of mouth marketing? Let’s see how other brands are doing it. 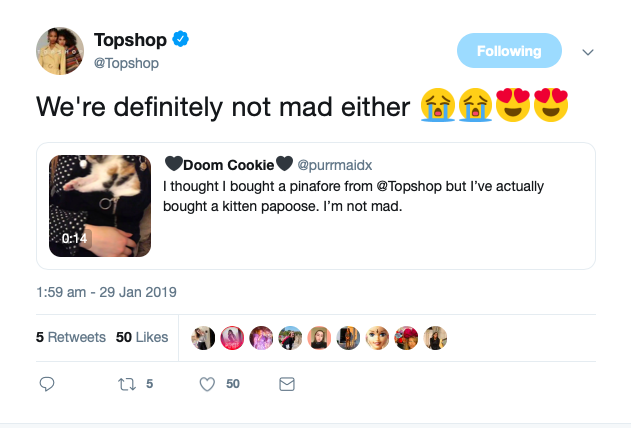 For example, Crocs leverages user-generated content under the hashtag #comeasyouare grabbed eyeballs and the campaign turned into a worldwide success. They encourage their customers to post their photos and videos on social media platforms wearing their products with the hashtag #comeasyouare. They also feature the images on their website and social media platforms. Create a unique hashtag to identify the content created by your customers. Encourage your customers to share their photos, videos, and gifs on social media by offering rewards in the form of discount coupons and free gifts. Showcase the user-generated content on your website as well as your social media channels. Hugely popular brands may not need to use incentives to compel people to share the content, however, you have to incentivize this technique of word of mouth marketing. Customer testimonials and reviews give your audience an assurance that your product is indeed worth spending money and time on. It also makes customers feel more comfortable and less cynical before closing the final deal. There’s a reason they call it social proof! There are so many ways to feature your testimonials and reviews. If your customers are some of the most prominent companies in the world, then this sort of testimonial will work wonderfully. However, if your customers are relatively unknown this sort of testimonial might not work as effectively. If you want to take your word of mouth marketing even a step further, then you can share case studies and add the link on your landing page. You can also encourage some popular review sites to write a review on your product or service. How many of you purchase something from Amazon after you see the product’s customer rating? I bet, most of the people consider star ratings before making the final purchase. In fact, every one-star increase in a Yelp rating means a 5 to 9% increase in revenue. So, incorporate the star-rating system in your website’s landing page to encourage your audience to buy your product. Nothing comes free in this world – not even customer referrals. In order to get referrals, you need to give your existing customers a reason. It doesn’t have to anything too big, just something valuable to the receiver. Take Uber for instance. 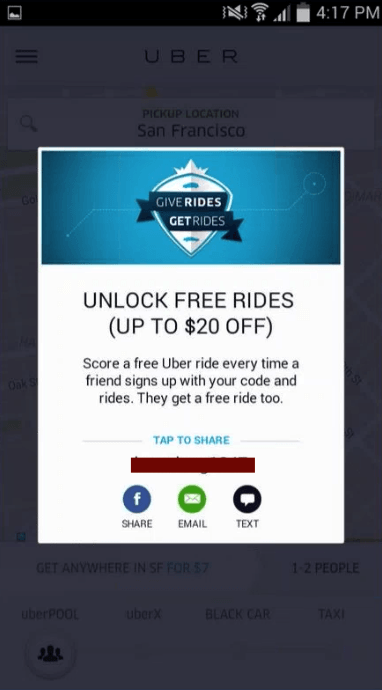 They reward their customers with free rides if they refer their service to their friends. Also, notice that it is a two-way process. Uber is not only rewarding its existing customer but also their prospect. If statistics are anything to go by, 92% of respondents trusted referrals from people they knew. This word of mouth marketing technique creates a referral chain. Say, for example, you will refer something to your friend, who in turn will refer to their friend, and so and so forth. Therefore, giving your customers appropriate rewards can skyrocket your word of mouth marketing which in turn will boost your business. Related Post: Top 10 Ways to Use Referral Marketing to Generate New Leads. Do you know that 60% of consumers have been influenced by a social media post or a blog review before purchasing a product or service? Please note that people don’t get influenced by just any post – the post and reviews have to come from an influencer in that niche. If you are a startup level B2B enterprise then it is highly unlikely that you will be able to feature a pro-level athlete or an A-list celebrity. It’s okay, no worries. Today, people are steadily leveraging influencers, who are like celebrities in their own circle of followers. Word of mouth marketing from an influencer is definitely valuable. However, identifying the right influencers is a challenge. You have to identify relevant influencer who has some impact on your target audience. According to 72% of marketers, social media is helpful to develop loyal fans. Word of mouth marketing will only work if you develop a tight-knit community on social media. For starters, you need to assess where your target audience is. Do they primarily use Instagram, LinkedIn, Twitter or Facebook? You should have an answer to this question. Once you identify where your target audience is, the next step is to build a social community. It can only be done if you personally engage your customers and prospects. Once you start interacting with your customers online, they will be more inclined to share your posts and products with their followers. Word of mouth marketing is heavily dependant on customer experience. Even freebies and other rewards are secondary to the customer experience. If you are elated after having a nice experience with a brand, you are likely to share that experience with your social media friends. This is a two-way sword. Your good customer service can welcome a positive post from your customer’s. On the other hand, if you don’t provide them with good customer service, it can also welcome their public ire. This can totally backfire on you and your brand. So, make sure that every single customer you have is happy with your customer service. Every organic word of mouth endorsement is a plus point for the growth of your business. The best part about word of mouth marketing techniques is that they are absolutely free of cost. So, even a simple startup can leverage these tactics. Spend time on building a tight-knit community of your target audience and everything else will fall into place. What is the best word of mouth marketing techniques that you have used to grow your business?